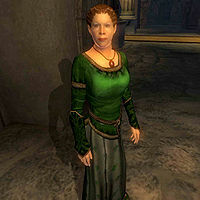 Yvara Channitte is a Breton noble and the private steward of Countess Narina Carvain at Castle Bruma. Compared to other stewards working under difficult circumstances in the many castles around Cyrodiil, Yvara lives an unproblematic life in Bruma Castle and seems quite satisfied with her daily routines. She sleeps in the middle section of the Lords Manor every night between midnight and 6am. After waking up she heads to the downstairs area of the Manor and strolls around in her favored area, at the bottom of the stairs near the door to the Chapel Hall. She will spend the entire day here, with a few exceptions: At 8am she pays a quick two-hour visit to the Chapel of Talos. At 12pm she will have a two hour lunch at the Jerall View Inn, and at 8pm she will participate in the Countess' formal dinner until her bedtime at midnight. The one exception to her schedule is during the Defense of Bruma, when she will be confined to the Lords Manor until the threat of invasion has passed. As to be expected, Yvara wears a selection of expensive upper-class attire, including a green brocade doublet, a green silk garment and a pair of green velvet shoes. She also wears a piece of leveled jewelry and carries around the key to the interior and the regular castle key as well as a large amount of gold. When you meet her for the first time, she will briefly introduce herself and her obligations: "I'm Yvara Channitte, Countess Bruma's steward. The Countess makes policy, leaving the details of administration to me." When asked about Bruma, she will give you a bit of surprising information about her relationship with the Captain of the Bruma Guard, Burd: "Captain Burd and I make a good pair. He understands Nords and the North, while I appreciate the subtleties of southern culture and politics." She is supposed to attend court with the Countess, but because of an oversight in her AI she will remain behind in the Lords Manor.